The Defense Department is expected to submit a legislative proposal to the White House Office of Management and Budget by Dec. 1 recommending that a Space Force be formed as a separate branch of the armed forces. 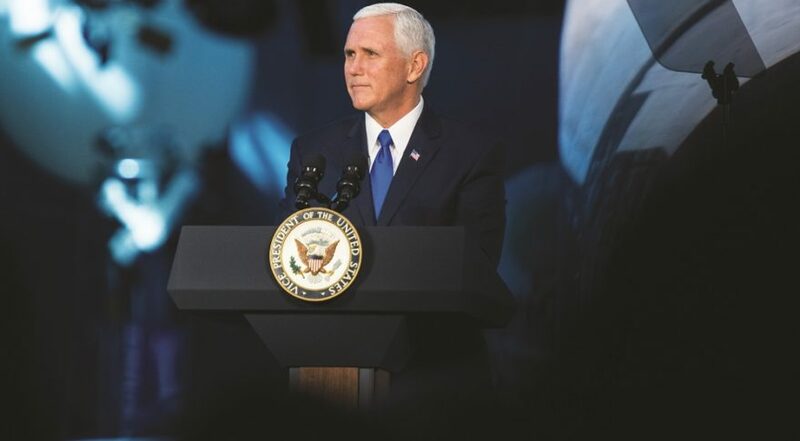 WASHINGTON — Vice President Mike Pence on Tuesday will hold a meeting of the National Space Council at the National Defense University to discuss the next steps toward creating a Space Force as a new branch of the U.S. military. During the last meeting of the council on June 18, Trump ordered the Pentagon to set up a Space Force but the president has not yet issued an official policy directive that lays out the steps ahead. The policy would be Space Policy Directive-4 — the fourth since President Trump activated the National Space Council in June 2017 by executive order. Trump has yet to sign the SPD-4 that would direct the establishment of a Space Force. A White House spokesperson declined to comment on whether the president has approved the policy directive or when he will sign it. According to a draft of the policy directive, the Defense Department would have to submit a legislative proposal to the White House Office of Management and Budget by Dec. 1 recommending that a Space Force be formed as a separate branch of the armed forces. DoD also would submit a budget request for the new service to be included in the president’s budget blueprint for fiscal year 2020. A draft of SPD-4 labeled “pre-decisional” was reviewed by SpaceNews. The draft says it is “imperative that the United States adapt its organization, policies, doctrine and capabilities to protect our interests” in space. It directs DoD to “take actions under existing authority to marshal its space resources into a Space Force” and craft a legislative proposal to establish a Department of the Space Force. The language in the policy draft reflects concerns that standing up a new military service could burden DoD with costly overhead and infrastructure associated with a new military department. A Space Force proposal put forth by Air Force Secretary Heather Wilson Sept. 14 projected the cost of forming a new military branch and a unified combatant command at about $13 billion over five years. She said that estimate is based on detailed analysis of what it would take to carry out the president’s vision. Critics of Wilson’s proposal allege that her cost estimate is too high and that a Space Force could be set up more economically. No alternative budget estimates have been publicly released to date. According to the draft policy document, the Space Force would be composed of a Department of the Space Force led by a civilian and a U.S. Space Force led by a four-star officer who would be a member of the Joint Chiefs of Staff. The term Space Force only applies to the new branch, not to U.S. Space Command, a unified combatant command that is in the process of being formed. The Space Force would be responsible to provide space services to all U.S. combatant commands. The SPD-4 would give DoD the official go-ahead to establish a unified command for space, a process that the Pentagon began last month. U.S. Space Command will take over responsibilities that were absorbed by U.S. Strategic Command in 2002 when the original U.S. Space Command created in 1985 was disestablished to free up resources to stand up U.S. Northern Command. Wilson suggested that the Space Force be combined with the National Reconnaissance Office and other organizations that focus on national security related to space. The recommendation in SPD-4 is to only bring “appropriate elements of the intelligence community” to the Space Force but not the entire NRO or any of the non-national security space missions that reside in the Commerce Department. The policy draft proposes forming the new service with military personnel from the active-duty, Reserves and National Guard ranks, as well as civilian employees. A White House spokesperson declined to comment on SPD-4, as it is still in the drafting process. Trump has issued three space policy directives thus far. SPD-1 in December 2017 focused on NASA partnering with the private sector for human spaceflight ventures. SPD-2 issued in May 2018 was about streamlining regulations on commercial use of space. SPD-3 in June 2018 dealt with space traffic management. Once SPD-4 is signed, DoD would have 30 days to identify the resources to establish the Space Force components; and 45 days to develop an operating model and structure for the Space Development Agency. As per standard procedure, the secretary of defense would publish the policy directive in the Federal Register. A big unknown is how Congress might react to the administration’s proposal. The legislative branch has the final say on whether plans for a new military service can move forward. Lawmakers on both sides of the aisle have endorsed the establishment of U.S. Space Command but many are not yet sold on the idea of a new military service, and would want to consider alternatives such as organizing a Space Corps under the Department of the Air Force. Opponents have challenged the idea of a separate service as wasteful spending that would drain resources and focus from the national security space mission, and have cautioned about unintended consequences of breaking up the Air Force. DoD meanwhile has begun to work on the legislative proposal. Running this effort is a senior-level committee led by Deputy Defense Secretary Patrick Shanahan. Shanahan has said he wants to minimize bureaucracy in a future Space Force and channel resources to technologies and capabilities. He also has been insistent that the new service should have a highly skilled workforce and establish closer ties with the private sector where billions of dollars are being invested in space technology. The meeting on Tuesday is being billed as the most detailed public discussion to date on the administration’s Space Force plans and the path ahead. Following remarks by National Space Council Chairman Pence and updates from council members, a panel of experts — former Deputy Assistant Secretary of Defense for Space Policy Doug Loverro, former space industry executive Mark Sirangelo and former Deputy Commander of U.S. Cyber Command retired Lt. Gen. James McLaughlin — will offer their views on space reorganization. Finally the council will vote on recommendations to be submitted to Trump. The members of the council include the Secretary of State, Secretary of Defense, Secretary of Commerce, Secretary of Transportation, Secretary of Homeland Security, Director of National Intelligence, Director of the Office of Budget and Management, National Security Adviser, NASA Administrator and Chairman of the Joint Chiefs of Staff.